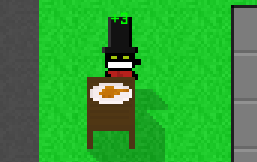 I have just added food to the game. A chicken leg can be bought in the shop for a couple gold in the Household Goods section. Once you've placed it in the world, press E to eat some delicious rotisserie chicken. Thanks to zloc6 and nine others for suggesting and voting this in the suggestion box. …Why are none of my comments working?! None of my comments seem to be working… They just won’t appear. Would someone let me know if my other 2 got through somehow? ‘Can’t please everyone,’ now THAT’s a true fact. Full-Size Dirt & Water Added » « Redeeming tokens should no longer give you a giant dog.